George loads up for his next rally. The back of the van doubles up as a living wagon. 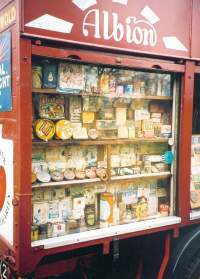 The nostalgic collection of old tins and packets on display in the shop window has taken thirty years to assemble. George gives the mudguards a polish before the first rally of the season. The radiator is protected from the elements with an old Civic Defence coat during the wintermonths. Lady Mary emerges from the cover of the barn in which she is garaged ready for the open road. 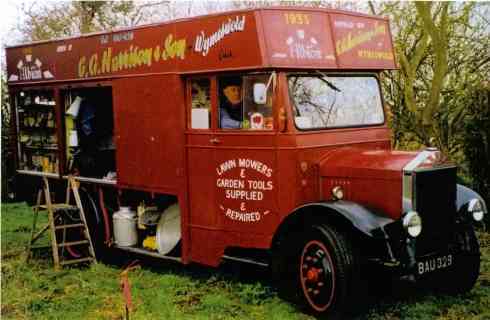 George Harrison purchased his Albion LH463 travelling hardware shop in the early 1970s from Alf Cooper of Leicester. 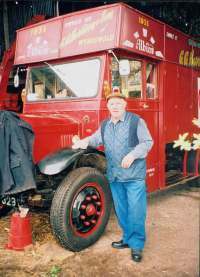 George celebrates his seventieth birthday in September and has been involved in steam and vintage rallies since the 1950s. Albion LH463s to have survived into preservation. Brian Howes went to meet them in Wymeswold. uilt at Scotstoun, near Glasgow, and used to great effect by the British Army during the First World War, Albion vehicles quickly gained a reputation for outstanding strength and reliability. 'Sure as the Sunrise' was the slogan behind those distinctive sun-burst radiators synonymous with Albion which, by the mid-1920s, was supplying three and a half ton short and long wheeelbase vans to a host of well-known names for the delivery of all manner of goods from batteries and paint to bread and biscuits. Built in December 1934 for bulk provision merchants A. B. Gibson Ltd of Nottingham, Albion LH463 (Chassis No. 14776 K, registration No. BAU 329)was fitted with a four-cylinder 60bhp engine, four-speed gearbox, single-plate clutch to an overspeed worm rear axle with vacuum brakes acting on all four wheels. The chassis was fitted with a special custom-built body containing side shutters and angled wooden shelves on which to display provisions, and BAU 329 went into service with Gibson's (later taken over by the VG Stores group) during the early months of 1935. After a few years on the road, however, BAU 329 was involved in a serious accident and ended up in a scrapyard at Newark-upon-Trent. It could so easily have been the end of the road for the Albion had she not been spotted by Alfred Cooper. Mr Cooper and his sister (known to all as 'Auntie') ran a general hardware business from premises at 237 Melton Road, Leicester, specialising in the sale and repair of lawn mowers and garden tools, plus the distribution of petroleum, paraffin and Bottogas. "The shop was a real timewarp crammed full of stock, there was stuff everywhere but Auntie Cooper knew where everything was instantly," recalled George. 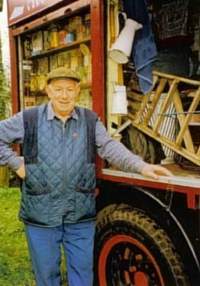 Having rescued the Albion, Alf Cooper removed the shelves and modified the body so it could carry hardware products and lawn mowers. He also fitted a large tank behind the cab with taps on both sides for ease of dispensing the petrol and paraffin. He travelled around the villages of North Leicestershire and it was during his weekly visits to Walton-on the-Wolds that George Harrison first became acquainted with the vehicle. 'I often joked with Alf that one day I would buy the van off him' said George, who will celebrate his 70th birthday in September. By the late 1960s the Albion had been replaced by a smaller van, and one evening during the early 1970s, completely out of the blue, Alfred Cooper called round to see George and Mary and offered to sell them the Albion. "We want it out of the way so you'd better come and look at it if you still want it," said Alf. By then it was a non-runner, laid up under piles of empty boxes and old lawn mower parts in Cooper's Melton Road workshop. 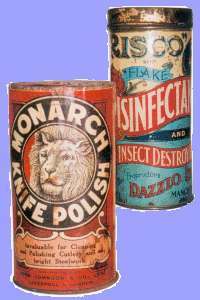 "It had siezed up and deteriorated to such an extent that I had to seriously consider whether it was worth taking on," said George. But thankfully he did, and after towing it home he set about restoring the Albion to its former glory. Beds were fitted in the rear of the body along with a stove to provide the family with basic living accommodation at rallies when required. A new engine was purchased and fitted and various rusting body parts were replaced. "Alf Cooper did not want his name to remain on the van, so when we painted her I replaced his name with mine and named it Lady Mary after the wife" said George. Lady Mary attended its first rally in 1972 and George and Mary began to assemble a fascinating collection of old hardware products to display in the side window and along the running boards. 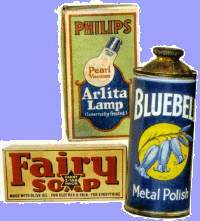 They include original tins and packets of old products like Cherry Blossom boot polish, Robin Starch, Chelsea Dubbin, Glee wash powder and Tinkerbell window cleaner. Galvanised bath tubs, buckets and dolly tubs are chained to the running boards just the way they were when Cooper's ran the van. 'Slow moving but still working' says a sign fixed to the back doors, below a pair of enamel signs advertising White Rose Oil and Royal Daylight Lamp Oil. George takes his time in Lady Mary, never rushing to get anywhere. 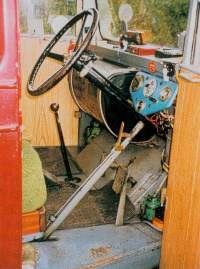 The longest journey he has made in Lady Mary was to attend the Albion Owners Club rally at Biggar in 1992, the van's first- ever trip north of the border – made on the back of an AEC flatbed. George and Mary Harrison are well respected by everyone connected with steam and vintage rallies around the Midlands, having been involved in vehicle preservation since the mid-1950s. 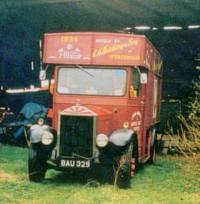 They bought their first old vehicle – an ex-RAF Bedford OB bus – from an MoD sale at Ruddington Depot in 1956. "We removed some of the seats and fitted beds into the back. We had some fun with that old bus, travelling all over the place in it, even up to my native Scotland. We sold it to the proprietor of a cafe we used to call in at and the last time we passed by the bus was still laid up outside but looking a bit the worse for wear," said Mary Harrison as we sat chatting in their cosy Wymeswold home. We looked through albums of fascinating photographs of the family's involvement in steam rallies over the past forty years. "Our children Thomas and Margaret were raised around the rally fields of the East Midlands," said Mary. Having sold the bus, their second acquisition was Aveling and Porter road roller No. 2018 of 1884 Wymeswold- the second-eldest known A&P roller to survive. Purchased jointly with close friend John Barnett from local farmer and steam enthusiast Cyril Grice, they took it to Kegworth Carnival and Cadeby Rally every year. Mary recalled the Rev. Teddy Boston, the local vicar at Cadeby being a great steam enthusiast and letting them park up outside the rectory. They parted company with Wymeswold for £600 when a crack in the cylinder chest meant that a lot of money would have had to be spent on it to keep it on the road. "We think it now belongs to two brothers in the Bristol area, but we haven't seen it since we sold it," said George. It's easy to understand why George Harrison has such a passion for vintage transport and steam-powered vehicles as virtually all of his working life has been spent working alongside vehicles and machines of one sort or another. His earliest memories of steam as a small boy were the road making gangs who turned up to repair the local lanes and pitched .up their living wagon on a patch of land close to his family home. "We used to look into the living wagon at night when it was lit up with paraffin lamps. I was fascinated by that steam roller and the men who operated it. "My first job on leaving school was on the land, although sadly the days of steam were all but over by then and they were using an Oliver tractor to drive the threshing drum. After the arrival of combines I worked for a company of contract harvesters towing a baler with an industrial tractor. "I think we charged around 6d a bale in those days," he recalled with a smile. He later worked as a maintenance fitter and had a stint working for Petter Engines. He also drove a Leyland LAD tractor towing a five-ton Queen Mary semi-trailer for Field Aircraft Services Ltd delivering grain and flour silos. For the past 11 years, George and Mary have helped to organise the Heart Link Steam and Vintage Festival, an event which has so far raised £175,000 for the East Midlands . Children's Heart Care Association. Mary organises the commercial vehicle and tractor section exhibits, while George sets up the field and organises proceedings on the day. They have certainly done more than their fair share for the vintage rally scene over the years and continue to put much more into the hobby than they ever take out. As my marvellous day with them in Wymeswold came to an end, Mary tucked one of her delicious home-made fruit loaves under my arm to eat on the journey home – generous to the end! They really are a very special couple, much loved by all who know them. 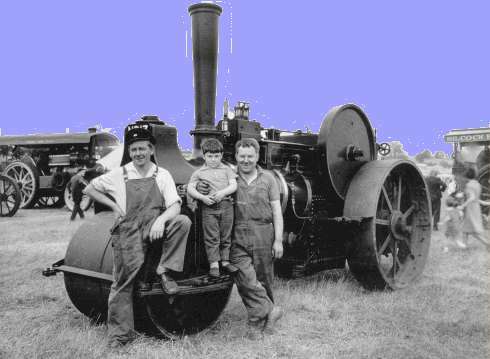 George Harrison holds on to his young son Thomas as they stand in front of Wymeswold with co-owner John Barnett at a steam rally in the 1960s. We are grateful to Peter Kelly, editor of Old Glory magazine, who has allowed us to reproduce this article from issue no.150, August 2002. We are also exceedingly grateful for copyright approval from Brian Howes, 819 Hucknall Road, Nottingham who wrote the original article and supplied us with all of his original colour photographs. The black & white photograph was supplied by George Harrison.